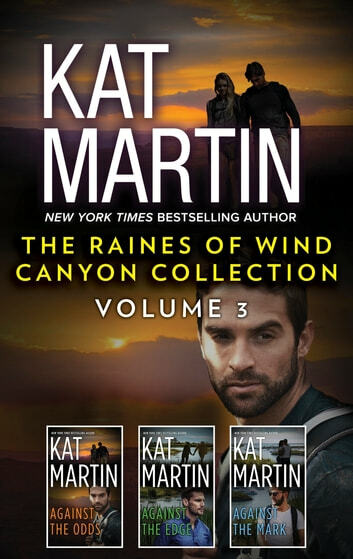 Don’t miss the final three stories in New York Times bestselling author Kat Martin’s Raines of Wind Canyon series. Former navy SEAL Ben Slocum is stunned when he is told he is a father—and his child is missing. According to the social worker Claire Chastain, his son was abducted by a man who wants revenge against Claire and Sam’s dead mother. The danger hits home, and the risks are endless—the son he’s desperate to save, the woman he’s desperate to love. Ben’s got one chance to take back what’s his, and in one gunshot he could lose it all. In one catastrophic instant, Haley Warren’s father was taken from her. She knows the explosion that killed him was no accident. 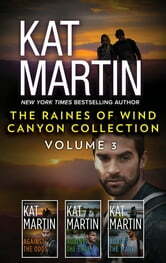 Tyler Brodie, the provocative and handsome P.I. hired by Haley, discovers that her father was investigating a suspected art theft. Although Ty’s a professional, he’s having trouble focusing on the case, and not the figure of his gorgeous client. The two are determined to get to the bottom of the case, even if it means they die trying.